Evaporators come in different varieties. We classify them, first with the help of the methods used to control the refrigerant flow through them. Later, we consider the types based on their construction. There are two different methods evaporator flow control. 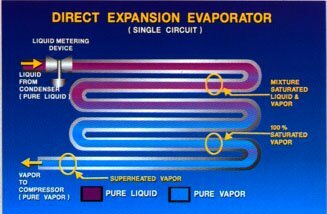 They are : (1) dry expansion evaporator, also called direct expansion or D-X-evaporators, and (2) of flooded evaporators. D-X-evaporators are used in the vast majority of comfort air conditioning systems below 100 tons of cooling capacity. They are also used on some refrigeration and industrial process cooling equipment. Flooded evaporators are used to the comfort of air-conditioning systems of more than 100 tons, especially where the centrifugal chillers liquid or absorption chillers are used. Refrigerating and technological tasks also use the flooded evaporators. The D-X evaporator, the refrigerant flow control, to refrigerant mainly liquid (wet) on the evaporator, but gas (dry) by the time it reaches the evaporator. 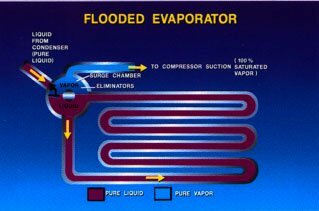 In the flooded evaporator refrigerant mainly with liquid (water) from the beginning to the end of the process. D-X evaporator, as shown here, is a continuous tube through which flows the refrigerant. The refrigerant from the dispenser is served at one end of the tube, and suction, compression is connected to the other end. The difference in pressure at the outlet of the evaporator inlet to the outlet causes the refrigerant flow. No recirculation of the gas or liquid refrigerant inside the evaporator. Rather, the refrigerant passes through the whole system before it enters the evaporator again. D-X evaporator has a clear point of separation of liquid and gas (steam) forms of refrigerant. The liquid refrigerant, with a small amount of gas, mixed, enters the evaporator, and, gradually, the share of gas increases until the refrigerant is becoming gas near the outlet of the evaporator. The refrigerant flow in D-X evaporator coil is controlled by a measuring device so that all liquid refrigerant transformed into vapor (gas) at the time of the refrigerant in the evaporator outlet. (Sometimes full conversion occurs just before the refrigerant reaches the outlet.) In fact, most of the D-X-evaporators have metering devices, intended for production of about 10F superheated gas in their outlets. Unlike D X evaporator, the flooded evaporator provides for the circulation of the refrigerant in the evaporator addition of separation or egalitarian. Liquid refrigerant enters the surge chamber through the dispenser and gravity causes it to flow down to the bottom pipe. The coil surfaces in contact with the refrigerant at any load. This design produces a very good heat transfer, but requires a larger, more expensive hardware than D-X design. It also requires a large amount of the refrigerant. Steam (or gas)produced in the flooded evaporator separated from the liquid in the surge chamber. Liquid recirculation through the evaporator again, while a pair of exiled compressor suction action.